I'm well under way with my Druze, and now that I've got a handful of games under my belt, I've been forming some thoughts about how I am putting my ITS lists together. Different players will always have different strategies and ideas, this article is just meant to talk about what I've found so far. That said I would LOVE to hear back from you, what's been working for you, and what other considerations you have when making a list for Druze Bayram Security (or DBS). Like any other army, the first place I start is by looking at the scenario(s) I'll be playing with the list. Broadly put, I am asking myself, "Are there buttons to push, is this a killing and seizing territory mission, are there any scenario specific considerations, what does my DataTracker do?" From the get go, my goal is to win the scenario, not just to make some random list, which is why I start with these questions. DBS, has a lot of tools at it's disposal, despite having a small selection of units to choose from. So lets talk about my answers to these questions. The fundamental task behind many scenarios involves interacting with a variety of objectives, typically accompanied by a WIP roll, or button pushing as it is endearingly referred to. If your goal is to get specialists up the board and push these buttons, then there are three units to really look at: Hunzakut, Bashi Bazouks, and Saito Togan. All of them have a special rule which allows them to deploy further up the board, either through Infiltration, or Aerial Deployment. Hunzakut are simply amazing. They are one of two infiltrating specialist options (the other being Saito), but they are dirt cheap, come with a lot of useful equipment, and have an amazing WIP 14. Most of my lists begin with 1, if not 2 of these gems. Not only do they push buttons well, but they can lay mines, put out repeaters, forward observe, and be a general nuisance. Their added utility is where they shine, though even for just the task of pushing buttons alone, they're well worth 18 points. Druze has a unique profile for Bashi Bazouks, which is a specialist operative with rifle + light shotgun. Parachutist means you can come in from any table edge that isn't in the enemy deployment zone, but you'll have to choose which board edge to deploy from at the beginning of the game. You are protected by your Holoprojector L2, which makes taking an ARO at least 66.6% less risky. The Hunzakut is ideal in scenarios where objectives are very far back on the table, or where there are saturation zones that prevent you from infiltrating further up the board. At 17 points, their cost puts them into the running with the Hunzakut, and they are only WIP12, so you'll have to choose between Holo2 and Parachutist, or Camo, Infiltration, and better WIP. The last of these kinds of specialists is Saito Togan. Borrowed from JSA, and improved with a +1 point Specialist Operative profile, Saito is an amazing unit. Essentially a souped up Ninja, he is the only source of TO Camouflage in Druze, as well as the only source of Smoke. Both of these are important considerations alone, but there is still more to him. In melee, he is an absolute monster, CC24, Martial Arts L4, and an Exploding CCW make him terrifying, but also capable at providing Anti-Materiel in The Grid and Looting and Sabotage. 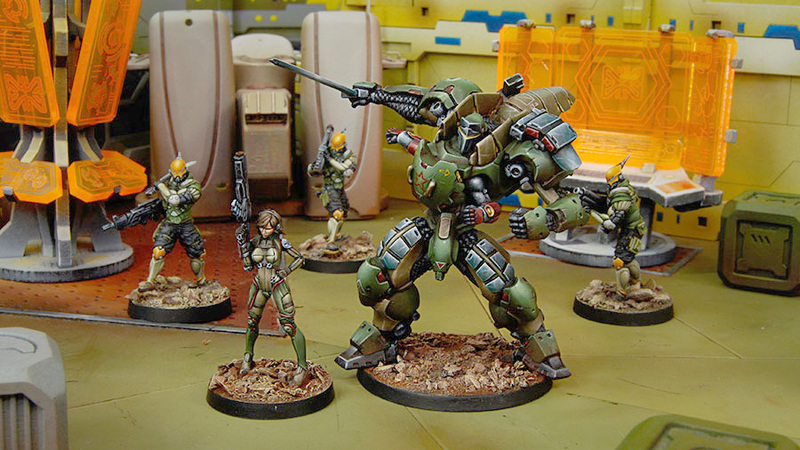 There are obviously more specialist options available, Pathfinders are fantastic thanks to their speed, while Brawlers bring a variety pack to choose from. I wouldn't rely entirely on Infiltrating/AD units, and always make sure I have a few other specialists lurking around, though that's not hard when you get such easy access to KHDs and AHDs. If your scenario involves killing enemy models, and/or seizing ground, then your list building is going to be concerned with some different tasks. You may not need many, or even any, units to interact with objectives, making units like Hunzakut less important. Fortunately, when it comes to bashing faces and murdering stuff, Druze excel. To effectively dispatch my opponent, I primarily look at Druze Shock Teams, and Peacemakers. If I need to claim territory, then more expensive units like Saito, TAG, or even a Kameel with Rifle + Light Shotgun may do the trick. Druze Shock Teams are obviously the backbone of the DBS army, they are invariably hard hitting, and loaded with gear and rules to make them even more deadly. All of the SWC weapon options in the link are brutally effective, though I tend to prefer the HMG, plus support from a Clipper or MSV2 Brawler, as well as the Light Grenade Launcher. This creates a robust unit with the weapons you want for a variety of tasks, though it does consume the majority of the SWC allowed in a list. A fully linked Clipper with Assisted Fire however means you're shooting a Burst 2, BS15 missile launcher, that ignores cover, letting almost always hit on a 15 if not an 18. The HMG is an obvious choice, giving you a high burst, high strength (Damage 16), option, but even the humble combi rifle is downright deadly in the hands of a Druze. With the burst bonus from the link, and the damage bonus from Fatality L1, you're basically getting 0 SWC Spitfires that are hitting on 15's up to 32"! This army loves remotes, and the Peacemaker bring a lot of what I love about PanO remotes. Mechanized Deployment works a lot like Infiltrating, letting you put a BS12 spitfire or heavy shotgun mid-field from the get go. With Gromoz or an EVO for Supportware, giving it assisted fire not only means it will ignore cover penalties, but it means your little Auxbot friend will be shooting a Fire + Shock heavy flamethrower! I find both weapon options incredibly helpful and viable, but be careful when taking two in a list, since they all have to deploy within 8". There are plenty of other units that murder stuff, or hold ground well. Saito as I already mentioned is a walking blender, Scarface & Cordelia, or the Anaconda both provide some tough, hard-hitting firepower. Le Muet is also very effective, with Forward Deployment, he can start in a quadrant, and provide brutal firepower with his MULTI Sniper Rifle, while being protected by ODD and Symbiont Armor. When you need to dominate table quadrants, or other sections (aside from Transmission Matrix), you may want to consider the Kameel with Rifle + Light Shotgun, as it will count as 41 points to hold down a zone, and be able to defend itself reasonably well. DataTrackers are something new this season, that we have to consider when building lists. Sometimes it's a huge amount of bonus points, other times it's inconsequential. If you are playing a scenario where your main goal is to keep your DataTracker alive, then consider using any old Brawler, or Druze, and hiding him, or if you want to get fancy, Arslan gives you a bit more resilience with NWI, dodging on 14's, and cannot be isolated, though he pays for all of it. Le Muet is even tougher, and has ODD, but also will be getting into more fire fights, so it can be risky. If your DataTracker needs to go off assassinating a target, I find that your options get limited fast. Le Muet seems very well geared for the job, with the extra resilience mentioned above, he also has a plethora of weaponry, letting him pick and choose the right weapon for the job. The biggest drawback of Le Muet though, is that he is only 4-2, making him a fairly slow choice to march across the table. Scarface is the fastest, non-remote option in the army, and thanks to his Duo ability with Cordelia (or Gromoz), he has become both more reliable, and harder to kill. His sheer speed and brutal weaponry makes him incredibly well suited any time you need a DataTracker to move across the board, and/or to make things dead. The Anaconda is also a decent choice, though less resilient than Scarface, and a bit slower, she's immune to Expel, and retains her points even after the TAG is dead, which can be handy if the mission is about holding territory. An example of putting all of this into practice, here is a list I came up with to play Tic-Tac-Toe. There is no DataTracker to worry about, and no Exclusion Zone, so I can infiltrate to my heart's content. There are however a ton of objectives that need to be interacted with by Specialists. To start the list off, I went with Saito, and two Hunzakuts, giving me the maximum compliment of infiltrating specialists you can get in Druze. I went with a core link of 3 Druze, a Brawler, and a Clipper, giving that link a huge variety of weapons (HMG, MSV2 MULTI Sniper, Missile Launcher, E/M LGL). To back them up there are a couple spare bodies in the form of the Brawler Lieutenant, and Valerya Gromoz who can fill any holes in the team if needed. 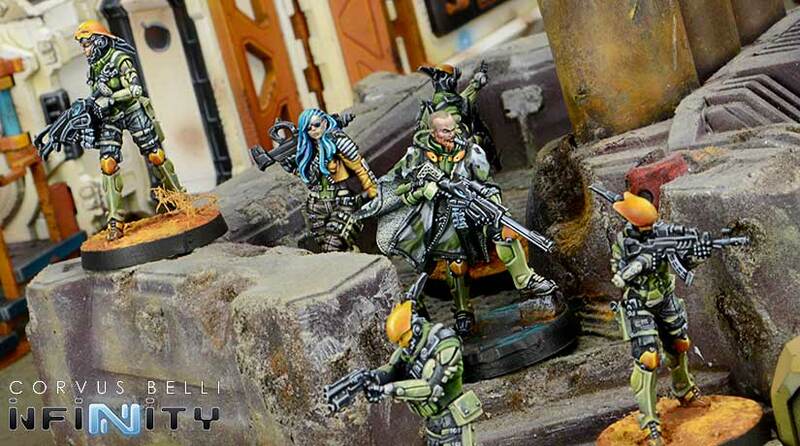 The second combat group gives me two more fast specialists in the Pathfinders, as well as a powerful mid-field combat remote. Overall, I feel like this list provides a devastating offensive strike, but also brings a lot of tools needed to win the scenario.